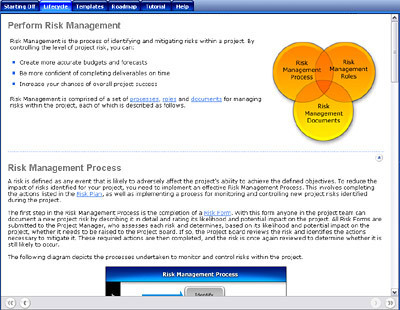 The MPMMTM Standard Edition contains the following project management software features which enable you to navigate the wealth of information quickly and easily. The Display Panel displays the page contents in the center of your screen. Within this panel, you will learn in detail how to undertake the Initiation, Planning, Execution and Closure phases within a project. The Page Summary Panel summarizes the content in each page to enable you to quickly get a grip on the key concepts. 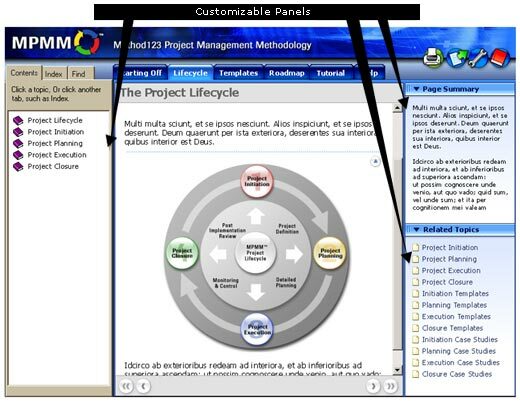 The Related Topics Panel lists other MPMM pages that are related to the topic in the Display Panel. By selecting a related topic, you can quickly navigate to other pages with supplementary content related to your current topic. The Navigation Tabs allow you to view the Contents in MPMM, check out the Index of all of the pages included in the tool and Find new content based on specific search criteria. The Display Tabs link you to Life Cycle activities, document and Templates. They also allow you to access the Roadmap, Tutorial and Help content. The Feature Buttons allow you to print content pages, export templates to Word or Excel, to access your MPMM Settings and view the MPMM Glossary of terms. These core features are intended to help you to quickly and easily navigate the wealth of content included within this Project Management Methodology. 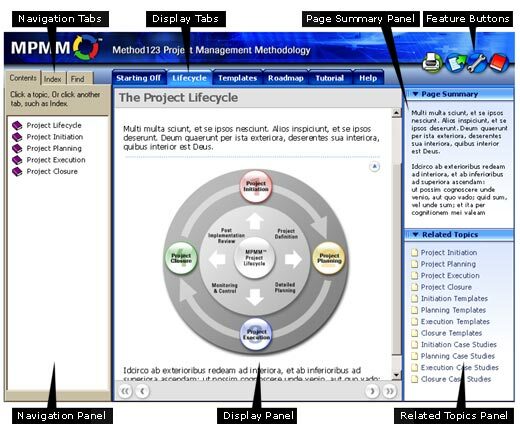 The Navigation Panel contains a hierarchy of information, allowing you to navigate directly to any activity or template within the MPMM Project Life Cycle. You can access every page in this product by drilling up and down through the content hierarchy in this panel. Click on a topic to view the list of sub-topics within it. Click on a sub-topic to view the content in the Display Panel. The Display Panel presents the content pages requested by the user. Whenever you select topics from the Navigation Panel, Related Topics Panel or any other links within the tool, the content you have requested will appear here. On each page you will notice a series of text links. You can select these links to navigate directly to other pages in MPMM. You can also click on many of the diagrams in MPMM to navigate to the respective content sections of each page. By clicking on any of the short-cut arrows found on the right hand side of the content displayed, you will immediately scroll up to the start of the page. The Page Summary Panel summarizes the content currently displayed in the Display Panel. It helps you grasp the content quickly without having to read the entire text. By reading a summary of each page, you will quickly get your bearings on each phase, activity, task, and template included in the MPMM Project Life Cycle. MPMM Navigation Tabs give you three easy ways to find the content you need. The Contents tab enables you to navigate the complete hierarchy of information included within MPMM. The Index tab takes you to view an alphabetical listing of all of the content pages. The Find tab allows you to search for relevant content pages based on the search string you enter. Printing. Select this button to print any page in this toolset. Export. Click to export any Template to the relevant Microsoft application. Settings. Select Settings to view any of the core settings in this software suite. Glossary. Click for definitions of all commonly used terminology in MPMM. To have the best possible viewing experience while using this product, you should customize the size of each viewing panel to fit your screen size and resolution. You can click and drag each of borders on any panel (as depicted by the following diagram) to enlarge or minimize that panel to suit your needs. "To manage multiple construction projects at the same time, you need to have a project delivery framework that works. MPMM provides this framework, as well as all of the tools needed to do the job properly."